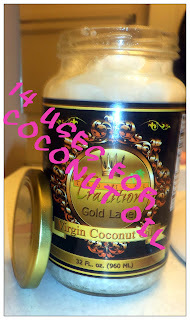 Mama Love: My 13 Favorite Uses for COCONUT OIL!! with a Giveaway!! 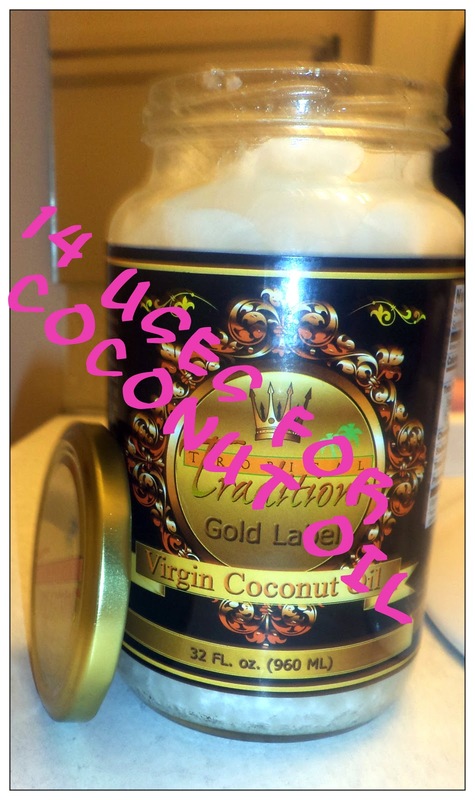 My 13 Favorite Uses for COCONUT OIL!! with a Giveaway!! If you are ever on Pinterest I’m sure you’ve been bombarded with Coconut oil Ideas and uses lately. Well I thought I would share my favorite coconut oil and my favorite uses for Coconut oil! 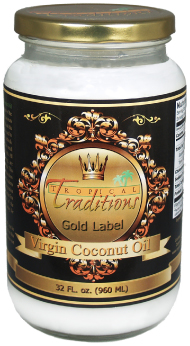 My Go to Coconut Oil that never Fails me is TropicalTraditions Gold Label Virgin Coconut Oil, this coconut oil is always great quality and works for everything that I need it too. Containing only 117 calories per Tablespoon, each nutrient-dense serving is 0 carbohydrates, perfect for low-carbohydrate diets. It’s great! In fact, when I’m not rubbing it into my skin, I’m incorporating it in my daily meals somehow! Ok Here are My top 13 Uses for coconut oil and yes I’ve actually tried all of these!! 1. HAIR MASK: Coconut Oil is Fantastic for conditioning your hair!!! I apply coconut oil to my dry hair (all over massage it in) then blast it with my hair drier for a few quick minutes (the heat helps with nutrient absorption) then I leave it in my hair for 15-30 minutes and to rinse it out I shampoo like normal (sometimes you’ll have to shampoo twice) but your hair is left silky soft and shiny and smells great!! I use a coconut mask in my hair at least once a month!! 2. EYE CREAM: Coconut oil is amazing for moisturizing around the eyes and it’s natural and in no way will irritate that delicate skin! I Noticed a difference after just 1 night of using coconut oil as my eye cream! 3. SHAVE : This has to be one of my favorite uses for coconut oil!!!! I use it in place of shaving cream and my legs have never been softer or smoother! The coconut oil helped achieve a closer shave and left my skin so soft and smelling great!! 4. LIPS: Dab some coconut oil on your chapped lips and you’ll have baby soft lips almost instantly! 5. HANDS: Do you have dry icky hands? Well use Coconut Oil in place of lotion and watch you r hands and nail beds change wonderfully!! You’ll have soft skin!! 6. EYE MAKEUP REMOVER: Coconut Oil works Wonderfully for removing Eye makeup, I use to use baby oil and would still have to scrub some of the mascara or eyeliner off, but since switching to coconut oil with one quick wipe my eye makeup is off, and it’s great for the skin too!! 7. FACIAL CLEANSER: Like I mentioned above Coconut oil is great doe Acne, well why not replace your chemical filled facial cleanser and opt for a more natural one, Coconut Oil!! It not only cleans your face but it won’t leave your skin dry! Just scrub it on and wash it off!! 8. DANDRUFF/CRADLE CAP: My 2 year old daughter still had horrible cradle cap but after washing her hair with coconut oil, it was gone!! Same applies to Dandruff, just massage it in let it sit a few minutes and rinse it out! 9. ALL OVER MOSTURIZER: Use Coconut oil everywhere! I use it in place of lotions and my skin has never been healthier!!! 10. SUNBURN: do you need instant sunburn relief?? Use Coconut Oil, it will help soothe that dry itchy burning skin! Mix your dry ingredients in a bowl and set a side, then cream coconut oil, sugars, and vanilla in a bowl, add eggs 1 at a time, then slowly mix in the dry ingredients and then chocolate chips! Bake at 350 for 5-8 minutes. 12. EAT IT: I add about 3 tbsp to my protein shakes, it’s a natural sweetener, low in calories and ZERO carbs, also it’s super healthy for you!! Mix it all together and put in a pretty jar (I put mine in a mason jar) then you have your very own sugar scrub that is great for your skin and way cheap and easy to make! Not to mention I love the combination of coconut and lime scent!! DO YOU HAVE ANY USES FOR COCONUT OIL? I LOVE FINDING NEW WAYS TO USE IT!!! Do YOu Want to Win Your Very OWN Quart Of Gold Label Tropical Tradition Virgin Coconut Oil? Use the Rafflecopter below!! I tried the coconut oil as a hair conditioner yesterday and absolutely love it! I've never had such shiny and manageable hair after only shampooing my hair! I'm hooked! kind of information in such an ideal manner of writing? I have a presentation subsequent week, and I'm at the search for such info. the phone itself without having to log onto a computer to download them. Hi there, I discovered your blog by way of Google even as looking for a comparable subject, your site came up, it looks good.